Gilgel Gibe II, Ethiopia’s pyramidal hydroelectric power plant built on the epicenter of moving East African and Nubian Plaque has dangerously started service after suspended operation for 11 months ago. The collapse of the tunnel was mainly caused by the movement of separating East African Rift Valley stretching from Afar Triangle down to the Omo , thus river creating a new ocean breaking the Horn of Africa from the rest of the continent into an island. Gibe II dam fatally stopped operation immediately after it started service on these moving plates earlier this year due to the collapse of 26 km long tunnel. This dangerous project initially cost Italian company Salini 375 million euros. The reconstruction of these destructive Dam cost almost half of the initial cost of construction. 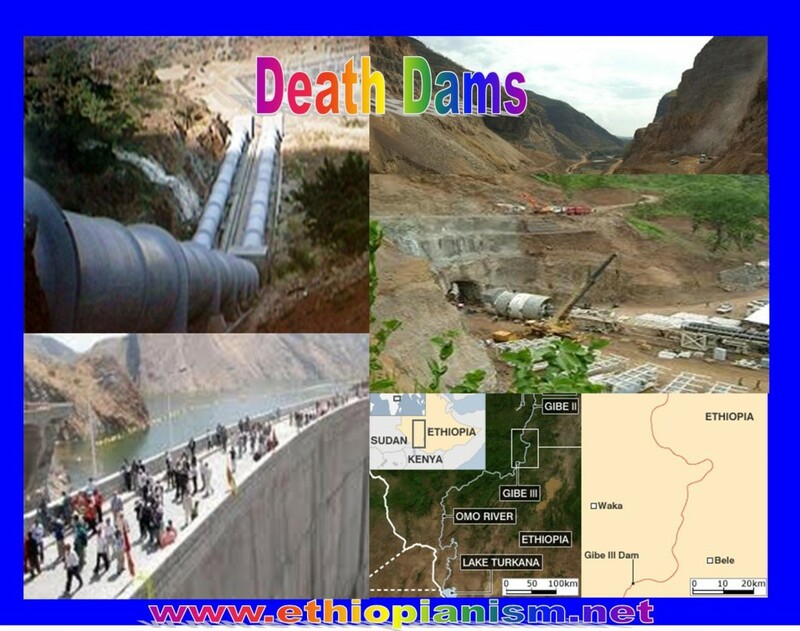 Ethipian dictator’s other destructive Dams are those of Tana Beles at the source of the River Nile and Tekeze. Both dams’ will mostly be used for irrigation on the grabbed fertile lands, thus diminishing the amount of water that will flow down to Sudan and Egypt. With the increase of land grabbing in the country for intensive commercial farms, the river basin will also weaken and eventually dry the Nile and the Tekeze rivers. The traditional Ethiopian farmers who have been evicted from their ancestral farms by the land grabbers never used water intensive farms and crops for over a three millennium. In the contrarily these new commercial crops are not environment friendly rather will affect the only remaining meager forestry in the south if any left in the country. Commercial farms in general are water intensive when it comes producing in quantity. When it comes to non renewable fossil energy an industrial farms will need more than ever for the ever demanding cash crops production and most of the land could be used such production and rural urban immigration will definitively grow by the evicted farmers whose land have been grabbed moving to the cities. The increase Eastern African tectonic plate movement created a Geological split in the tunnels, however, the ruling dictator gave order to reconstruct the deadly tunnel after being briefed that it had caused a major slit in the concrete lining 9kms deep in the over 25kms long tunnel on 22 January, almost a week after inauguration. But shamefully the Ethiopian genocidal strong man ordered the reopening of the risky plant which was closed 25 January, 2010. GII uses water from another deadly dam constructed more than 26kms away for an existing power plant called GI. After it generates 180Mw at the older station, the water is channeled through 25.8kms long, 6.3m diameter concrete tunnel bowered through chains of volcanic mountains to generate 420Mw at GII. The recent Earth Quake which menaced the region with a force 5.1 riche Terre has affected the three dams in the region further risking the inhabitants. The arrogant obstinate Ethiopian dictator has provoked the extinction of the original cradle of humanity the Omotic population from the face of the earth. Over 1 and half million inhabitant down river will starve by end of the damming project by the drastic change of their traditional way of life depending on the cyclic flooding of the Omo River. These fragile tunnels are supported by a steep elevation, two 1,000m long metal penstocks at GII pouring water from the tunnel in the mid-height of a tectonic mountain down to the turbines at the bottom, gushing power station menacing to explode even with a minimum earth Quake caused by ever opening moving rift valley which the dams helplessly trying to connect together. With water pressure and the moving plates could bust at any time in the rainy season like last winter over flooding the dams killed unknown number of people and live stock displacing over 100 thousands. Ethiopia was forced to fall in a power crisis caused by the ruling regime led to a regular power shedding in order to justify its construction of megalomaniac dams in a country where the already existing dams have not been used to their maximum potential. The existing dams would have been reinforced before constructing further at the expense of the environment and extension of Omotic people. The dictator schedule for almost a decade now the country to embark on the construction of more than five ambitious power plants strictly to be used for export orientated commercial grabbed lands at the expense of the local farmers and power exportation for the neighboring countries, as Zneawie dreams to become a water power. Such projects will risk the down river inhabitants of Lake Turkana in Kenya, Sudan and Egypt. The genocidal corrupted dictator ordered to shed power intensively over the past three years, thus artificially to prospect the resolution of the crisis by commissioning destructive plants, like GII. The hastily constructed dams proved the contrary by collapsing. The so called Ethiopia’s landscape and its river basins are said to have given the country a potential to generate over 46,000Mw hydropower but its current electricity generation capacity is 2,000MW, more than double from 2006 is a myth. Since the country situated in live volcanic region of the world with a high risk of eruption and unprecedented earth quake will the lives of Millions in the region. The magalomaniac dictator Melese must be stopped before further damaging the region leading to water crisis as seen from his recent declartion of war against Egypt. Ethiopia must embark to more alternative nature friendly energy powers like, gas, wind, solar and thermal energy than deadly dams to the destruction of the flora and fauna of the country. Moreover, such non consented projects will menace the neighboring countries like Egypt and Sudan leading to eventual war and conflict. The Great Ethiopian Rift Valley – Koka Plains ..